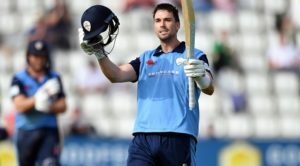 Tom Lace (48 not out) and Wayne Madsen (41 not out) led the Derbyshire fightback in the final session on Day Three as the hosts closed on 97-2, with a lead of 38 runs. The pair added an unbeaten 79 having lost two early wickets which had given Gloucestershire hope of forcing a result in this Specsavers County Championship match in Bristol. The partnership comes as Derbyshire look to build a second innings lead after the hosts were earlier dismissed for 350. 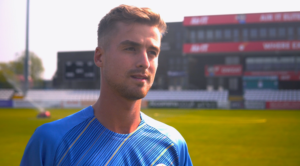 Derbyshire took the new ball at the first opportunity in the morning of Day Three, but they failed to get the early breakthrough they wanted as Ryan Higgins (74) continued to be the aggressor. He went past 50 as did his partner Roderick as the pair brought up the century stand and Alex Hughes and Matt Critchley were brought into the attack. But it was Reece, who stood out with the ball yesterday, who broke the partnership, bowling Higgins as he played across the line to a straight delivery over the wicket. On 290-6 at lunch, trailing by just one run, Gloucestershire were well set to forge a first innings lead and put pressure on the travelling Derbyshire batsmen. The lead was tempered slightly as Logan van Beek struck twice late on to remove Roderick, caught behind two short of his century, and Harry Hankins for 9. All out for 350, they posted a 59-run first innings lead, with Derbyshire facing a tricky few overs before tea. The reply started poorly, losing Reece to the second ball of the innings and captain Billy Godleman (6) shortly after tea. With Gloucestershire buoyed by the chance to make substantial inroads into the Derbyshire order, Madsen and Lace steadied the innings before building nicely and bringing up the 50 partnership in the 31st over. 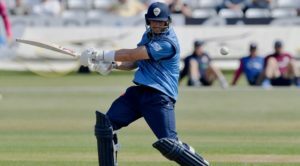 The pair continued to bat well to the close, picking off the bad balls as the Gloucestershire attack tired, guiding Derbyshire to 97-2 with a lead of 38 runs.